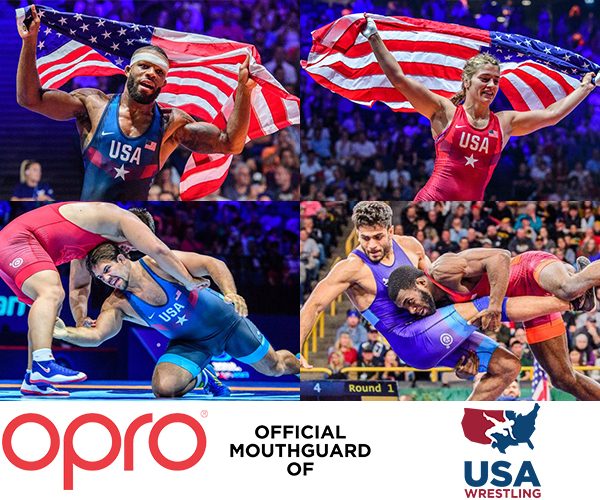 Along with their current partnerships with the Ultimate Fighting Championship (UFC), Wrestling Canada Lutte, USA Taekwondo, and many other international combat sport organizations, OPRO’s partnership with USA Wrestling firmly positions the organization as the “go-to” mouth guard brand for combat sports. The partnership will provide elite level mouth guards to each USA Wrestling Senior National Team athlete, as well as make their top-quality products available at the grassroots level of the sport. USA Wrestling is the National Governing Body for wrestling in the United States and, as such, is its representative to the United States Olympic Committee and United World Wrestling, the international wrestling federation. Simply, USA Wrestling is the central organization that coordinates amateur wrestling programs in the nation and works to create interest and participation in these programs. USA Wrestling’s 230,000-plus membership is comprised of athletes of all ages, coaches, officials, parents and fans. On the elite level, USA Wrestling is responsible for the selection and training of teams to represent the U.S. in international competition, including the World Championships and Olympic Games. In 2017, USA Wrestling won the World Championships in Senior Men’s Freestyle and Junior Men’s Freestyle. On the developmental level, USA Wrestling fosters grassroots expansion of the sport, through the sanctioning of age-group tournaments and the chartering of wrestling clubs. National and regional championships are held for wrestlers from nine years old through the Senior level. For more information, visit TheMat.com. Founded 20 years ago by dentist Dr Anthony Lovat, OPRO is the world’s most technically advanced mouth guard company and a leading pioneer in oral protection. Through the development and deployment of cutting-edge technology and the use of innovative design and production methods, OPRO has been at the forefront of protecting the safety of athletes at all levels, across a range of different sports, for more than two decades. OPRO is the official mouth guard partner of a number of professional sporting organisations, including Great Britain Taekwondo, England Boxing, Ultimate Fighting Championship (UFC), Great Britain and England Hockey, USA Rugby, American Youth Football, England Rugby, New Zealand Rugby, Australia Rugby, 11 Gallagher Premiership Rugby teams and the German, French, Italian, Cameroonian and Northern Ireland Mixed Martial Arts Federations. All OPRO mouth guards are legally CE certified and in 2007 the company was awarded the Queen’s Award for Innovation in recognition of its ground-breaking work in the field of oral protection.